Pop-up, Plug & Waste, Tight P, and our award-winning FlexiTrap™ with its unique 5° range of motion, no matter what your requirements may be, we’ve got the trap range covered. In support of this, we launch our finger licking good FlexiTrap™ promotion on Monday, 1 October 2018. 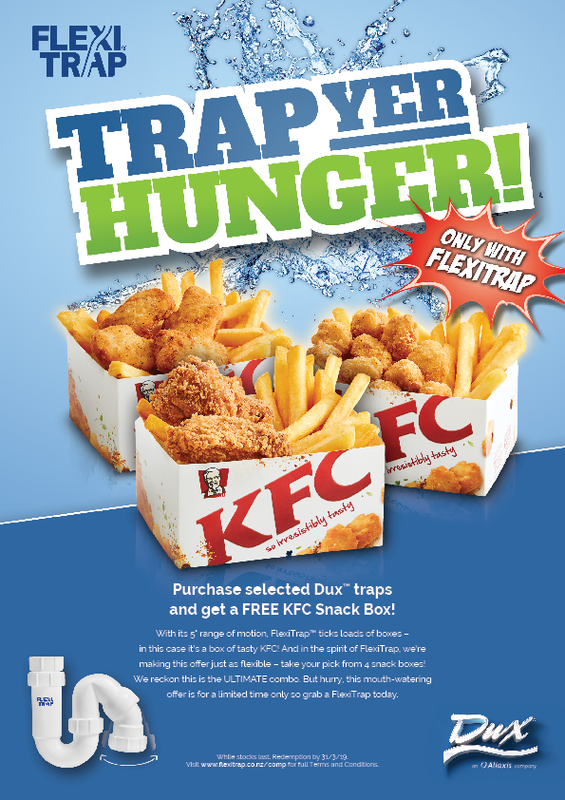 Purchase selected Dux™ traps and get a FREE KFC Snack Box! In the spirit of FlexiTrap, we’ve made this offer just as flexible – you can take your pick from 4 snack boxes! Text the unique code found on selected Dux traps to ‘393’ and receive a digital voucher code back, then head in to any KFC store and show the text message to claim a free KFC Snack Box.